We believe training should be both fun and a rewarding experience for you and your dog. 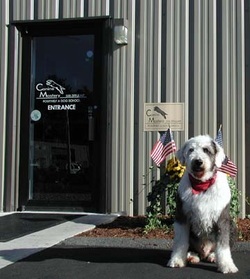 We offer a variety of classes and events for all dogs young and old, whether you want an agility trial champion or a lap dog companion.Our centrally located facility is both heated and air-conditioned. It is outfitted with ¾’’ matting designed with you and your dog’s comfort and safety in mind. See all the amenities our facilities offer including our retail store, Full Service Grooming, our fully equipped kitchen, and our indoor & outdoor training areas. We are available for rental for your local obedience club or for an entertaining birthday party for you and your friends. Canine Mastery’s training methods are simple and straightforward. We employ State of the Art approaches using clicker/reward based training and positive reinforcement techniques. We utilize skills that will make training fun for you and your dog. Our class size is limited and our specialized instructors are all well versed in the most modern and effective methods for solving behavior problems by using positive methods. We will teach you to train your dog by using praise, consistency, patience, and most importantly, a sense of humor. We believe that a well-trained dog is easier to live with; they have more privileges and most importantly make wonderful companions. We invite you and your family to visit any one of our classes and to talk with our highly trained staff. For our customers that choose to feed a natural, raw meat-based diet, we are a proud distributor of Bravo Raw Foundation Food - the food that makes your dog cheer. We are also distributors of many high quality dry and canned dog foods as well. We offer special order programs for our members.